Last night after the Symphony performance we headed back to German Village for some noshing at G. Michael’s, the terrific bistro located within a few blocks of our new home. We wanted to sample some of their “small plates” — which seemed like a wise option, as opposed to a full-blown meal, after 10 p.m. on a Friday night. Guess what? The G. Michael’s “small plates” aren’t in fact, very small . . . but they are incredibly tasty. Kish and the CCC each got the shrimp and grits, which is one of the bistro’s signature dishes, and shared a side of brussel sprouts and couldn’t finish it all. 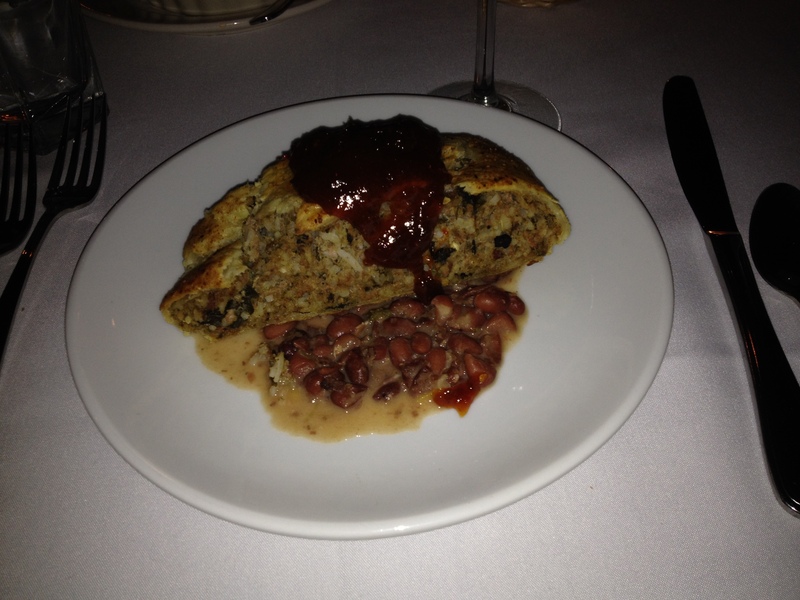 I got the housemade sausage stuffed strudel, with low country red beans and pepper jam, pictured above, which was both huge and fantastic, with a very pleasant spicy kick that more than held its own against a good glass of red wine. I ate every bit of it. At the end of the meal our great waitress gave us good news and bad news. The bad news is that the G. Michael’s autumn menu will be ending in a week or so, and the excellent sausage strudel will be cycling off the carte. (Noooooo!!!!!) The good news is that the talented chefs at G. Michael’s no doubt have already created new, equally tasty concoctions to replace it — well, in a manner of speaking — on the menu. 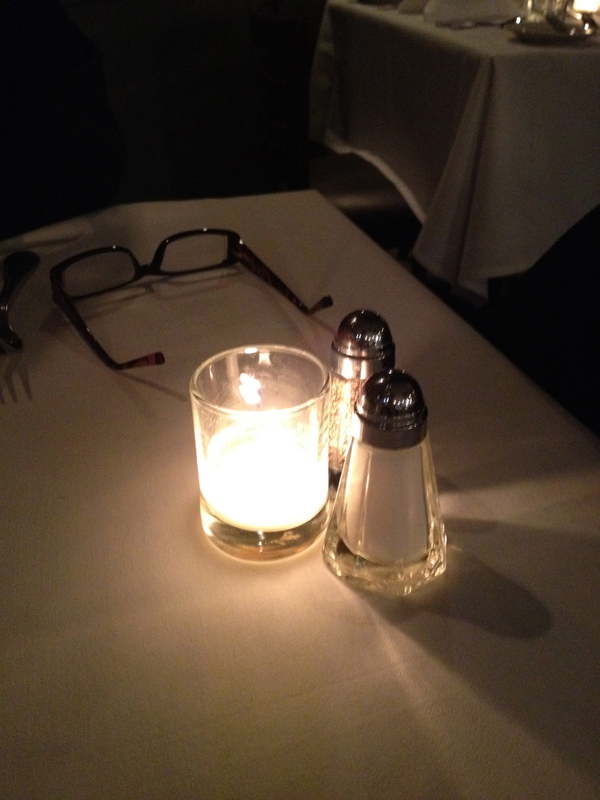 Incidentally, the late-evening dining ambiance at G. Michael’s is very enjoyable. We got there as most of the supper crowd was clearing out, and we enjoyed sitting in the quiet, candlelit, white tablecloth-topped dining room, listening to some mellow jazz selections on the sound system and hearing the clink of glasses as the bartenders prepared to close up shop while we finished our drinks and dessert. It’s another reason why G. Michael’s is one of Columbus’ very best restaurants. Last night Kish, the Carroll County Cousin, and I went to the mighty Ohio Theater for a performance of the Columbus Symphony. It was the debut of the next Music Director for the Symphony, Rossen Milanov, who comes to Ohio’s Capital City after stints with the New Jersey Orchesta and as assistant conductor of the Philadelphia Orchestra. Milanov technically is Music Director Designee — his four-year contract as Music Director begins in the 2015-16 season — but last night’s performance suggests he is already very much in charge. With a contagiously enthusiastic demeanor, a demonstrative conducting style, and a very cool looking quasi-Nehru jacket, Milanov led the CSO through a selection by Edward Elgar that he described as a personal favorite, a new cello concerto by Mason Bates that the Columbus Symphony helped commission and that featured some terrific playing by the talented Joshua Roman, and finally Saint-Saens’ excellent and moving Organ Symphony. Roman also unexpectedly treated us to the sublime Prelude to Bach’s Cello Suite No. 1 as a kind of personal encore after the Bates concerto was concluded. It was a very enjoyable program and drew a pretty good Friday night crowd, even though the announced playlist didn’t include any of the big-name composers, like Mozart and Beethoven, who typically fill the seats. It also reminded me that, as enjoyable as classical music is on an iPod or a CD, there is nothing quite like watching a full orchestra playing in unison and experienced, and relishing, the powerful sound it produces. Kish and I decided that we need to come back to another Symphony concert soon, and we’re betting that Maestro Milanov will make our next visit an equally enjoyable one. 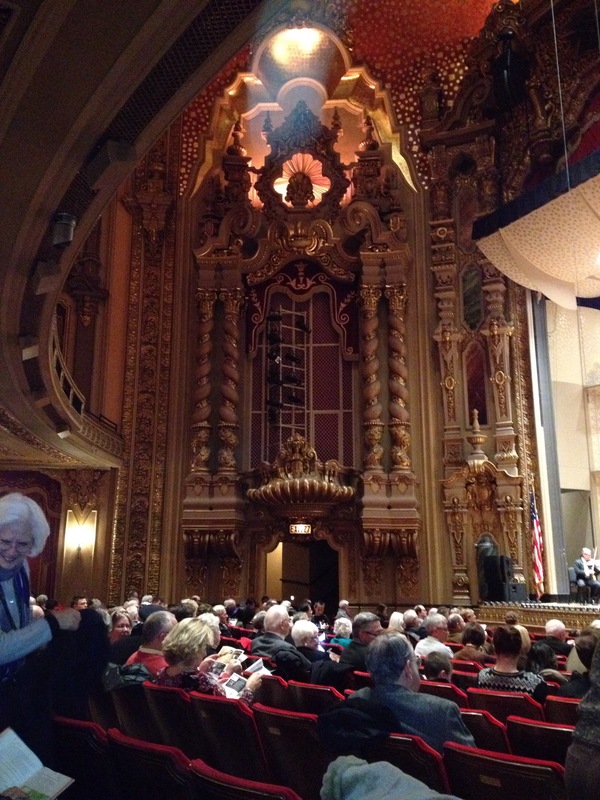 We’re at the Ohio Theatre with the Carroll County Cousin for some organ music with the Columbus Symphony Orchestra. State of the Union policy proposals come, often in rapid-fire fashion, and go. President Obama’s proposal to tax “529” college savings accounts, announced only last week and withdrawn this week, may have set a record for the quickest skedaddle. 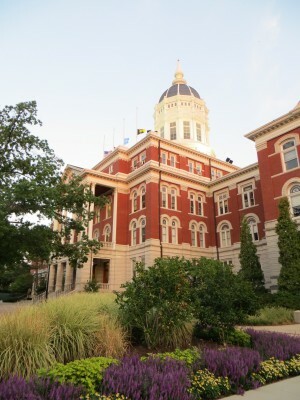 The 529 plans are such a good deal that more than 7 million of them have been created. President and Mrs. Obama have them for their daughters, for example, and put $240,000 into those plans back in 2007. And while the Obama Administration argues that the tax benefits for those plans predominantly favor “the rich,” it all depends on how you define “middle class” in modern America. As the New York Times points out, 10 percent of 529 plans have been established by people with incomes below $50,000, and 70 percent of the total number of 529 accounts are owned by households with annual income below $150,000. Is a two wage-earner family that makes $140,000 really wealthy? My guess is that most families in that category don’t look at things that way. The President’s 529 tax plan was a trial balloon that quickly was shown to be a lead balloon, opposed not only by the people who set up the 529 accounts, and the entities that hold and manage those accounts, but by Democrats and Republicans alike. House Minority Leader Nancy Pelosi reportedly personally lobbied President Obama to ditch the 529 tax plan on a recent plane flight. And the optics of the proposal aren’t that great, either. For generations, a cornerstone of American policy has been to help citizens get their kids to college — and now we’re going to tax those industrious folks who plan ahead and save for college for their kids and grandchildren, rather than letting them be saddled with crushing student loan debt as they go forward into their adult lives? Of all of the tax breaks available in the endless Internal Revenue Code, this is the one we’re attacking? You can argue, I suppose, about whether the 529 tax plan was good policy, but there’s no doubt that it was bad politics. I’m guessing that “529’d” might become part of the dictionary of political slang, to be used in the future whenever an ill-conceived proposal gets raised, quickly torpedoed, and then flushed forever down the memory hole. Those of us over a certain age learned that Pluto was the ninth planet in the solar system, and the one farthest from the Sun. In 2006, however, Pluto was “de-planetized,” when the know-it-alls at the International Astronomical Union concluded that Pluto should be relegated to “dwarf planet” status. Pluto itself could not be reached for comment. Since it was dissed nine years ago, tiny Pluto has stolidly borne its politically incorrect “dwarf planet” label. Still, it’s an intriguing object. It’s tiny (smaller than our Moon), its orbit is different from that of any other planet, it’s unimaginably far away (on average, 3.6 billion miles from the Sun, 40 times farther away than Earth) and its deeply mysterious because we’ve never gotten a good look at it. Even though Pluto was discovered in 1930, we still don’t have any decent picture of the object. That’s about to change. Recently, NASA’s New Horizons spacecraft entered its Pluto exploration zone. It was launched in 2006 and has traveled more than 4 billion miles to get near Pluto. For most of that time, the spacecraft’s active systems have been “sleeping.” Now, New Horizons has been awakened, and last Sunday it began to take its first pictures of Pluto. It’s closest pass will come in July. As New Horizons transmits its photos back to Earth, we’ll learn far more about Pluto than we’ve ever known before. I’m rooting for little Pluto, which has basically been ignored in favor of studies of Jupiter, Saturn, and Mars. I’m hoping that Pluto turns out to be the most fascinating object in the solar system. Who knows? Maybe Pluto is small and weird because it’s not a planet at all, but instead an alien spacecraft, or a marker like The Object in 2001. Probably not . . . but a Plutophile can dream. I’m pretty sure that Pinocchio was the first movie I ever saw in a movie theater. In those pre-video and pre-DVD days, the classic animated Walt Disney films were reissued to the movie theaters on a multi-year rotation basis, there to be enjoyed by a new generation of little kids. The Webner kids saw Pinocchio on one of the reissuances, in a full-sized movie theater with a huge screen and top of the line sound system. When people think of Pinocchio, they typically think of the charming and friendly Jiminy Cricket and the helpful Blue Fairy, of Pinocchio’s funny nose growing with each implausible lie, of Pinocchio dancing with Geppetto and his squeeze box, and of the great songs — Give A Little Whistle, Hi-Diddle-Dee-Dee (An Actor’s Life for Me), and of course When You Wish Upon A Star. Not me. 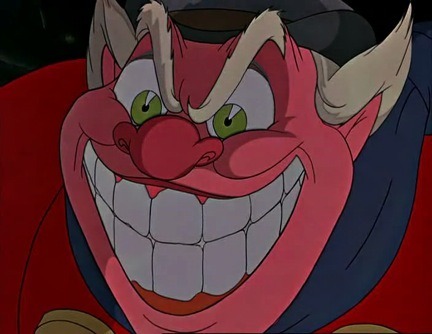 I thought Pinocchio was terrifying, and even now when I think of the movie the little boy inside still cringes. Of course, Pinocchio is a morality tale; real boys are supposed to be honest, good and true and listen to their consciences. But the real eye-opener for this little kid was the notion that there are bad people lurking out there who act like your friends but are ready to lure you from school, clap you into a bird cage, make you sick with a cigar at Pleasure Island, and turn you into a donkey. Used as I was to walking to school every day with UJ in our tidy Akron neighborhood, that notion was astonishing. And even though I was pretty sure that little boys who misbehaved couldn’t be turned into donkeys, the scene where Pinocchio’s big-talking miscreant pals are transformed into frightened braying jackasses still had a huge impact. What if the seemingly nice people I encountered during the day were like the initially jolly Coachman who turned out to be evil incarnate? I haven’t seen a Disney animated movie since Richard and Russell were little, so I don’t know if their films still have scary characters and scenes. Pinocchio packed a punch because the bad guys were truly frightening and the terrified realization of the boys changed forever into donkeys seemed indisputably real. I’m not saying Pinocchio cured me of bad behavior — Mom and my siblings would certainly dispute that notion — but the scary parts introduced new concepts about the potential costs of naivete and naughtiness and the presence of wickedness in the world that had a real impact. I thought of Pinocchio and the awful Coachman the other day when I was reading about the latest bad person to take terrible advantage of trusting people. The lesson endures. Your intrepid reporter was walking down East Town Street, heading in the direction of the Columbus Commons, when he happened upon this apparent water main break. Water was bubbling out of the underground pipes where some work was being done, flooding the street and flowing downhill toward Fourth Street. In the cold, of course, the risk is that the water freezes over and turns part of the downtown road system into a skating rink. 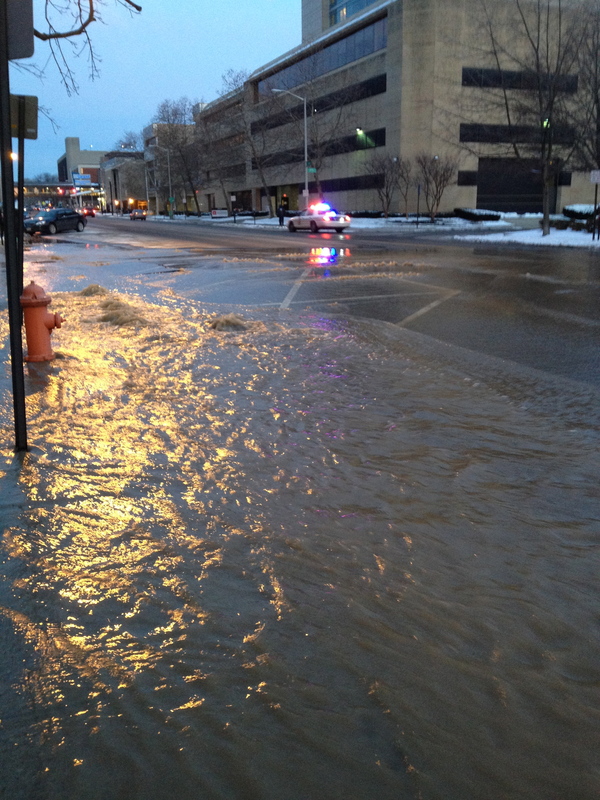 All this means is that some poor maintenance workers are in for a cold and wet evening battling the water main break. Thanks in advance to those under-appreciated workers whose tireless patchings and repairs keep our infrastructure in shape!